What can the acknowledgements page of an academic book reveal to us about the discipline of literary studies? Scholarly acknowledgment is often characterized by the special fulsomeness of its intimate enumeration of gratitude. It’s easy to experience a kind of vertigo when moving from the cozy intimacy of these expressions of thanks to the rigorous delimitations and impersonal critical surveys of the introductory material that follows. What would it mean to close the gap between these modes—to uncordon acknowledgment from prefatory convention so that it infuses more overtly within a monograph’s critical investigations? How might the work of denoting scholarly debts extend beyond a demarcated page to shape the sensibility of a book as a whole? These are questions I found myself asking recently, while trying to write an acknowledgements page of my own. In preparation for this pleasurable and pressurized task, I found myself rereading the familiar acknowledgements of books within the field most formative for my own thinking—the field of pragmatist literary criticism. In those pages, acknowledgement is funneled again and again toward the same source, my own mentors affirming in turn the influence of Richard Poirier—the figure who actively taught each of them to read pragmatically, and also the scholar singularly credited with bringing the American philosophical tradition of pragmatism to literary studies for the first time in the late 1980s. 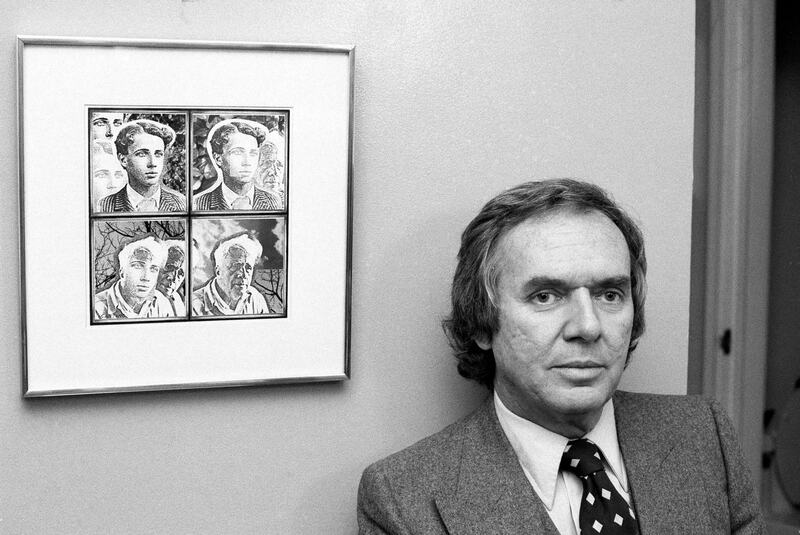 Richard Poirier beside an image of his mentor, Frost, featured on the cover of the first edition of his book, Robert Frost: The Work of Knowing (1977). Robert Walker/The New York Times/Redux. Poirier’s books model an integrative approach to acknowledgment. Rather than opening with pages of thanks, he chooses to conclude his key 1992 volume, Poetry and Pragmatism, with an appreciative essay that honors his teachers. In this essay, “Reading Pragmatically: The Example of Hum 6,” Poirier renounces any exceptional status as the first pragmatist literary critic by instead fitting himself within a long line of classroom-based mentorship. The pragmatist critical genealogy Poirier outlines passes by direct tutelage from Ralph Waldo Emerson to William James, from James to Robert Frost, and from Frost to Poirier by way of Reuben Brower, the founder of a General Education course taught at Harvard through the 1950s and 1960s called “Humanities 6: The Interpretation of Literature” (abbreviated to “Hum 6” by its participants). As Emerson’s godson, James receives unfiltered mentoring in the Emersonian practice described by Poirier as “a form of linguistic skepticism.” This early tutelage informs for James a lifelong practice of reading that is “at once grateful to the cultural inheritance of language and suspicious of it, congenitally uncertain as to the meaning of words and correspondingly attentive to nuance” (Poirier, Poetry and Pragmatism, 178). In Poirier’s portrayal, James’s classroom in turn cultivates this actively skeptical quality in students at Harvard, a voracious attentiveness that expresses both indebtedness and incredulity toward its objects of study, equipping them to read, write, and act without illusion or intimidation, despite the congenital uncertainty endemic to human life. Poirier usefully reframes the history of literary studies as a discipline by insisting that the interpretive practices of pragmatism are inseparable from pedagogy. Among James’s renowned students (Gertrude Stein, Wallace Stevens), Frost emerges as the first major American poet to hold a permanent position as a college professor. Brower would become a student of Frost at Amherst College before going on to likewise teach at his alma mater. There Brower helped found “English 1,” the parent course of Hum 6, in which Poirier was enrolled at Amherst before moving with his mentor to Harvard, where he served as a Hum 6 teaching assistant and section leader from 1953-1961. Writing of that experience in Poetry and Pragmatism, Poirier credits Hum 6 for teaching him to read in “slow motion,” a phrase coined by Brower to describe the distinctive variety of close reading that students practiced in his class. As Poirier suggests, this practice differed starkly from the era’s most prominent critical techniques: “reading ideally remained in motion, not choosing to encapsulate itself, as New Critical readings nearly always ultimately aspire to do” (Poetry and Pragmatism, 180-81). 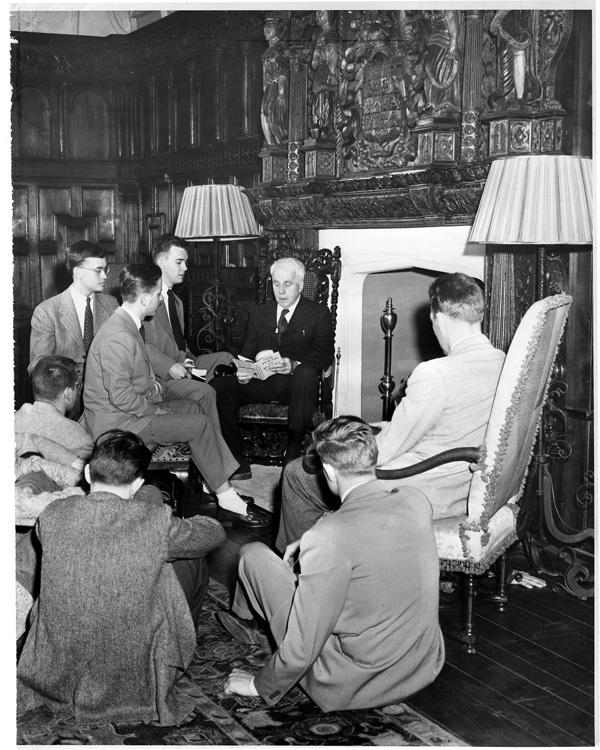 Robert Frost and students discussing poetry at the Mead Art Museum at Amherst College. Amherst College Archives and Special Collections. Poirier’s Hum 6 essay explicitly contrasts the kind of close reading that was the signature practice in Brower’s courses with the New Critical directives codified and disseminated by another of his teachers, Cleanth Brooks. In contrast to the New Critical goal of arriving at the “total meaning” of a text, Brower teaches slow reading as “the art of not arriving” (Poetry and Pragmatism, 179). As Poirier observes, “any kind of close reading in the fifties and sixties came to be called New Criticism”; this is because literary-critical histories of the period only account for “what got into publication,” while excluding “what went on in the classrooms with teachers who published little” (Poetry and Pragmatism, 184). Whereas such written polemics as Brooks’s Understanding Poetry and Understanding Fiction necessarily arrive at decisive conclusions, Poirier affirms that processes of reading in slow motion “should never end”—should never achieve the closure of final statements or general theories (193). Significantly, the brand of pragmatism most notable to Poirier was practiced and disseminated by teachers but infrequently reified in print: its privileging of adaptable and provisional practices better suits the fluid scene of the classroom than the fixative scene of publication. For Poirier, Brooks exemplifies a broader tendency for literary critics to put theory before reading, a prioritizing of conceptual rigidity above contingent experience. When codified into pre-formulated programs and prescribed procedures, a potentially useful pedagogical tool comes only to confirm what the theorist already purports to know. Reuben Brower at Harvard. HUP Brower, Reuben (3A), Harvard University Archives. The distinction Poirier draws between his two teachers, Brower and Brooks, also marks out two paths for literary criticism. One entrenched critical narrative looks to New Criticism to explain why pragmatism failed to take hold as a method with literary applications in English departments during the period of pragmatism’s broader cultural ascendancy. According to this account, at the same moment that pragmatism was being declared “almost the official philosophy of America,” New Critics were working to restrict its influence on literary study. It’s not hard to imagine how the pragmatist insistence on practical use and experiential effect would appear wholly anathema to New Criticism’s strictly systematic and impersonal interpretive project of asserting the autonomy of aesthetic objects. While in this critical narrative Hum 6 stands at a promising disciplinary crossroads, the New Critical juggernaut ensures that the path of literary pragmatism remains “the road not taken” save by a select few. Yet just as Poirier’s work on Frost inverts a conventional reading of his most famous poem—where a binary choice between divergent roads allows for the rigid commitment that makes “all the difference”—Poirier also resists any straightforward understanding of literary study as a discipline decisively and permanently split along methodological lines. Instead, Poirier attends to the way that the history of literary studies is retrospectively shaped by published polemics at the expense of more nuanced pedagogical encounters. To begin to recover the true impact of the classroom in a course like Hum 6 is for Poirier also to recuperate the pedagogical practice of pragmatist literary criticism. Refuting any pioneering credit in bringing pragmatism to literary studies for the first time in the 1980s, Poirier insists that a pragmatist reading practice has run concomitant to the more notorious trajectory of New Critical approaches to close reading since the inauguration of Hum 6. In fact, Poirier challenges close readers to trace that lineage back much further by placing Brower in a genealogy of teacher-critics that begins with Emerson. Not coincidentally, those who undertake the work of extending this Emersonian genealogy are the same critics who avow deepest appreciation for Poirier’s “inspired mentoring.” As I recounted at the outset of this essay, these are also the critics who have mentored my own practices of pragmatist literary criticism. Yet in trying to write my own acknowledgements, the prefatory pages of the studies most formative to my book weren’t much help, offering no fixed model of gratitude that I might emulate. Steven Meyer’s Irresistible Dictation (2001) and Joan Richardson’s A Natural History of Pragmatism (2007), for instance, both forgo a conventional acknowledgments page in favor of prefaces that artfully integrate their thanks into the introductory work of positioning themselves within a critical conversation. Throughout these texts, Meyer and Richardson reiterate how their methodological and stylistic commitments constitute an extended form of acknowledgement that permeates beyond the prefatory. As Richardson writes: “Readers will notice throughout my indebtedness to those who through their work have helped me learn how to read, what to do: put my ear to the ground of language to listen for shifting rhythms, halts, swerves in direction that signal movements of mind.” Everything that follows, she attests, is an attempt to “honor” the models of her teachers in “sentences and paragraphs”—a syntax and a gestalt of indebtedness—that might intrinsically “practice the self-reflexive method of Pragmatism” (The Natural History of Pragmatism, xiii). To me, this is a powerful reminder of how my mentoring influences are already irrepressibly conveyed and celebrated by my literary methodology. While an acknowledgments page may gesture at squaring an outstanding intellectual bill, such debts, thankfully, can never really be discharged. As the lineage of pragmatist pedagogy serves to illuminate, perennial acts of acknowledgement are what comprise our notion of a literary discipline. The persistence of our debt is, in this case, our solvency—obligation and discovery compounding anew in each and every sentence. Richard Poirier, Poetry and Pragmatism (Cambridge, MA: Harvard University Press, 1992), 4. Poirier taught alongside half a dozen other Hum 6 section leaders, some of whom would go on to have illustrious critical careers, including Paul de Man and Peter Brooks. Poirier writes that he “studied with Brooks at Yale for a year after Amherst,” and then “taught from Brooks and Warren’s Understanding Poetry at Williams College for two years after that” (Poetry and Pragmatism, 184). 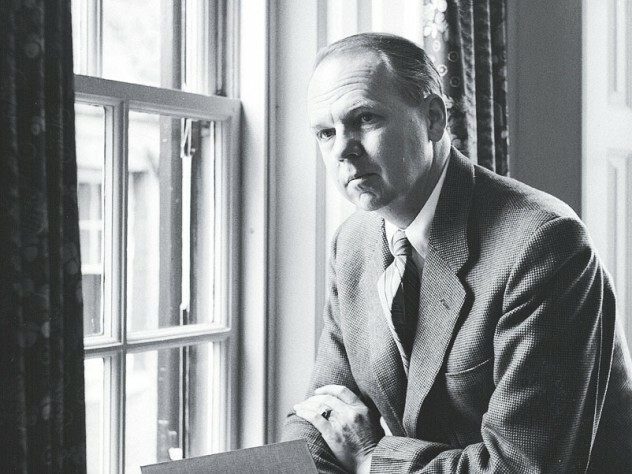 Cleanth Brooks co-wrote the widely circulated textbook Understanding Poetry with Robert Penn Warren in 1938, followed by Understanding Fiction in 1943. Nicholas Gaskill summarizes this view in “What Difference Can Pragmatism Make for Literary Study?,” American Literary History 24.2 (2012): 374–89. Morris Dickstein tells a similar story in his introduction to The Revival of Pragmatism (Durham, NC: Duke University Press, 1998). Henry Steele Commager, The American Mind: An Interpretation of American Thought and Character Since the 1880’s (New Haven, CT: Yale University Press, 1950), 97. Joan Richardson, A Natural History of Pragmatism: The Fact of Feeling from Jonathan Edwards to Gertrude Stein (New York: Cambridge University Press, 2007), xv. See also Steven Meyer, Irresistible Dictation: Gertrude Stein and the Correlations of Writing and Science (Stanford, CA: Stanford University Press, 2002).